MOUNT PLEASANT JUNCTION on the Post Office Tube Railway. The miniature trains can shift nearly 30,000 mail bags a day. Each station is provided with lifts and spiral chutes, while many have moving conveyors and elevators to deal with the mail. ONE of the most interesting railways in the world runs below Central London, carries no passengers, is worked without drivers, conductors or signals, and its existence is unknown to the majority of Londoners. This line is the Post Office Tube between Paddington and Whitechapel, which was built with the object of speeding up the distribution of letters and parcels between the railway termini and the principal district post offices on the route, simplifying the sorting office organization and giving a more regular and frequent service than would be possible with road transport. 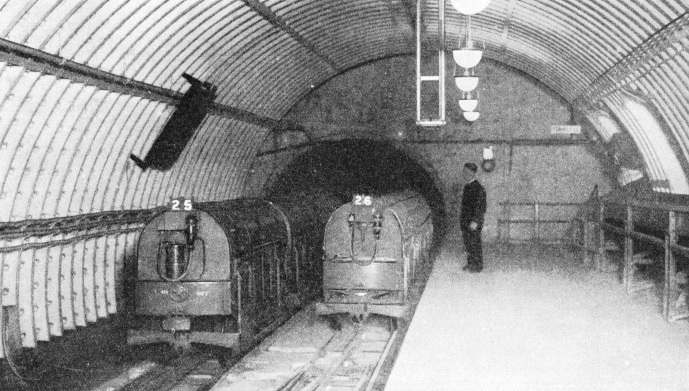 As long ago as 1862 there was already in operation a species of miniature tube built by the Pneumatic Conveyance Company for the carriage of mail-bags between Euston Station and the North-Western District Office, about half a mile away. This handy means of communication may be regarded as the forerunner of the present tube. The railway, which is six and a half miles in length, and of which the original cost was about a million and a half pounds, was begun in 1914, but construction was stopped during the war, when the completed tunnels were used to store national art treasures away from the dangers of air raids. Work was further delayed by the coal stoppage of 1926, among other causes, and the line was not opened for traffic until December, 1927. There are eight stations, and, as will be seen from the accompanying map, the line follows closely the route of the eastern section of the Central London Railway, save for the detour necessary to serve Mount Pleasant, where the headquarters of the system are situated. The method of construction follows the general lines of standard tube railway practice, save in the matter of dimensions. The gauge is only 2 ft, and while the stations themselves are roomy, the main tunnels, which carry both east- and west-bound tracks, are only 9 ft in diameter. This is reduced to 7 ft at the station approaches, where the tunnel divides into two. These dimensions are, however, larger than they appear, since the standard diameter of the London tube railways (carrying a single track) is no more than 11 ft 8¼ in (save for the Great Northern and City, which was built with the idea of accommodating main-line coaching stock, a scheme that, however, never materialized), while the diameter of the original City and South London Railway - the first tube in the world - was only 10 ft 6 in prior to the rebuilding of the line. The east- and west-bound platforms are distinct, but on the same level, and are provided with facilities for inter-communication, and at each station the tracks branch out into four platform roads. In normal working conditions the inner tracks are used for stopping and the outer for non-stopping trains, but the outer roads are also available during the slack hours as sidings and for holding trains temporarily at rest. The inner and outer tracks are connected by scissor crossings. The platforms vary considerably in length, ranging from only 90 ft at the Western District Office Station to 313 ft at Mount Pleasant. LOADING A TRAIN with containers carrying the mail-bags at the station that lies below Mount Pleasant Post Office. The containers are wheeled into the trains over hinged fall plates on the wagons. The internal diameter of the tunnel at Mount Pleasant Station is 25 ft. When the railway was first opened operation was by two- or three-car trains, according to the time of day; but the original rolling stock, which, like the present, combined locomotive and wagon in a single vehicle, was found unequal to cope with the constantly increasing traffic, and all the ninety units, which carried a load of three-quarters of a ton, have now been withdrawn from service. The present vehicles, of which there are fifty, have a carrying capacity of more than twice as much as their predecessors - 1 ton 16 cwt each to be precise. They are mounted on eight wheels, of which the leading and trailing pair are coupled to the 22-hp motors. For emergency purposes, there are also three battery locomotives, with two 25-hp motors, which have on test proved capable of hauling a 54 tons load at sixteen miles an hour. These locomotives are normally stationed on sidings at three different points on the system, and their battery capacity is enough for hauling two-car trains the whole length of the railway at an average speed of twelve miles an hour. Two cars, it should be mentioned represent the maximum train make-up, while single-car units are run during the slack hours. The operating methods of this railway are unique. Control is exercised by the signalmen, whose cabins are fitted with illuminated track diagrams similar to those used on the London Underground Railways, on which the trains automatically indicate their movements within the section controlled by each box. Signalling in the ordinary sense does not exist; instead, the line is divided into short sections, and the passage of a train automatically cuts off the current from the length of track it has just traversed, which remains “dead” until the next section has been reached. Starting and stopping is effected by switching the current on and off. To receive a train the signalman sets the power-operated points for the section of route concerned, and energizes the conductor rails. At Mount Pleasant the control cabin is equipped with as many as fifty-six levers; the number is under-standable when it is borne in mind that, in addition to the quadruple tracks at the stations and the cross-overs and sidings, six of the eight stations are also equipped with reversing loops. MAP OF THE ROUTE showing the District Post Offices served by the railway. The length of the line is six and a half miles, and a single non-stop journey between termini normally occupies eighteen minutes. The stations are approached by up gradients, following the practice adopted on the Central London Railway, and on part of the City and South London’s Morden Extension. The incline is 1 in 20, and the combined effect of this gradient and the de-energizing of the conductor rail is to reduce the speed of the train until it comes to a standstill just outside the station. After a halt of a few seconds it starts again, enters the station at a speed of about eight miles an hour, and if it is scheduled to stop runs on to its platform berth section, which is “dead”, and is pulled up by the application of automatic brakes. The down gradient at the other end of the station, of course, assists the acceleration. Communication between the platform staff and the signalman is by a plunger device. In effect, the loaders notify the control cabin that the train is ready to start, and the signalman energizes the track. Station indicators are provided at all the platforms, and the staff is thus notified whether a train is stopping at all stations or only at selected points en route, and whether or not it is making the end-to-end journey. The stations are constructed in two tiers, the relays (of which there are over a thousand), switchgear, and other electrical equipment being housed in long galleries beneath the platforms. A remarkable engineering feature is that the point motors, instead of being at track level, are in certain instances, as at Mount Pleasant, situated in these lower galleries, this arrangement having been adopted on account of space restrictions. Current can in emergency be switched off any section from the control cabin, and if it is necessary to cut off the energy from the whole of the section controlled from a box, the operation is effected by two king levers. There is also an emergency platform control, which enables a three-minutes service to be provided if it has been necessary to suspend temporarily normal working conditions. The average daily traffic requires the handling of about 30,000 bags of mail matter. The end-to-end journey, if stops are being made at all stations, occupies approximately twenty-six minutes, on a schedule involving station stops of a minute each, except at Mount Pleasant, where the time allowance is two and a half minutes. But much higher overall speeds can be and are attained in actual practice, and there is a night “express” that runs non-stop between the eastern terminus and Paddington in a quarter of an hour. The station stops are longer than those on the London Underground Railways, but while the passenger loads and unloads himself, the loading and unloading of the postal trains involves a considerable amount of handling. Each car has four containers, accommodating a total load of sixty bags of letter mail or twenty-four of parcels. (These are average figures, which will naturally fluctuate according to postal traffic conditions.) As the train comes to a standstill alongside the platform, a hinged metal ramp on the vehicle is let down, thus bridging the gap between car and platform. The loading and unloading of the vehicle is by hand. A system of lifts and spiral chutes, in which mail matter for east- and west-bound trains is kept distinct, connects the platform at each station with the sorting offices above. Slow-moving containers are also installed at some of the stations, and these are used both for sending the mail matter up to the surface and from the sorting offices to the station platforms. THE CAR DEPOT AT MOUNT PLEASANT, with extensive sidings for carrying out repairs and any overhaul that may be necessary. Mount Pleasant also has a “running round loop line” and an intricate system of tunnelling. At Liverpool Street and Paddington, where the London and North Eastern and Great Western Railways respectively deal with large quantities of foreign in addition to inland mails, there is also an elaborate system for conveying the mail matter between the railway termini and the Post Office Tube stations. This is effected through apertures in the platforms of the main-line stations giving access to chutes and conveyers linking up with the platform of the postal railway. At Paddington, connexion is thus made both with the arrival platform and that portion of the Great Western terminus known to successive generations of railwaymen as “The Lawn”, which is situated between the Great Western Hotel and the head of the departure platforms. Paddington also provides a typical example of the reversing loop layout, to which reference has already been made. The loop here is of special value, as the station is the western terminus of the tube railway, and trains can also be reversed by Y-shaped sidings at each end. Such a track layout has the particular advantage of enabling a station to be used both for terminal and through working purposes, a matter of importance also in the event of the line being extended beyond its present limits. CABLE LAYING. 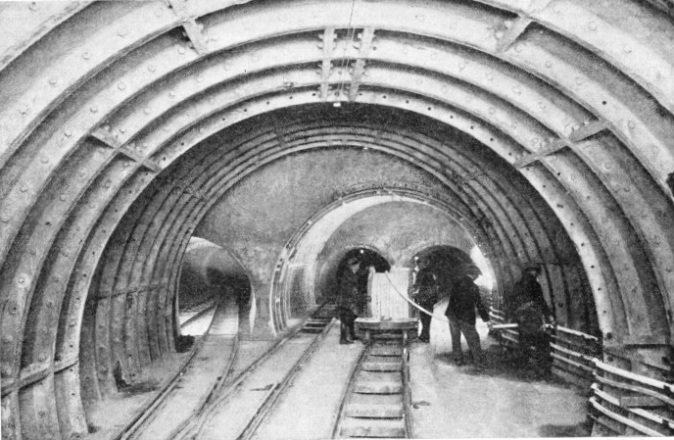 Owing to the small-diameter tunnels, difficulties were encountered when the cables were being laid. 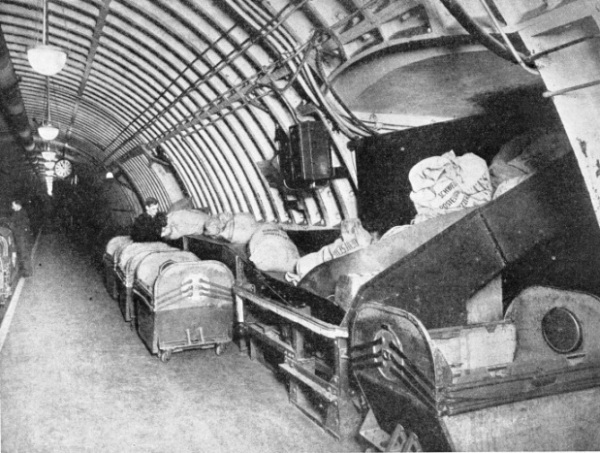 Low-loading crocodile trucks were built to carry the small cable drums through the tunnels. All these plans, although in abeyance at the time of writing, have not definitely been abandoned. In the meantime, road mail vans running over the projected routes feed the tube. It would be difficult to estimate the ultimate advantages accruing from the completion of the scheme, but they can be gauged from the fact that when the railway was opened, the immediate effect was to reduce the time of transit to between a third and a quarter of that taken by the mail vans, while it was calculated that rather over a quarter of the road vehicles in use in the area served would no longer be required. Apart from greater speed and regularity, taking the traffic beneath the surface has also played an important part in lessening highway congestion. Owing to the crowded roads in Central London the motor mail vans are delayed, but the tube is independent of traffic blocks. Postal matter can therefore be carried by tube continuously and without delay between the termini. PAPER INSULATION was used for the power cables which were also lead covered and wire armoured. This illustration shows the work in progress. SAFETY FIRST. So that there shall be no live rails in the depot, a train is moved by attaching to the power vehicle a flexible electric coupler connected to a collector trolley. This runs on a system of steel joists suspended from the roof of the depot, thus avoiding danger. Wagons are shunted by press-button control, the operator walking alongside the train. Except for week-ends, the Post Office Railway is at work very nearly all round the clock From Monday to Friday inclusive, it is open daily for twenty-two hours, shutting down only between 7 and 9 am, this two-hour break being enough to allow of any necessary track inspection. On Saturday night the service is suspended at 11 pm and the line is not re-opened until Sunday midnight, thus affording facilities during the week-end for repair work. No other tube railway in the world has so long a normal working day. Practically the whole equipment of the system is in duplicate, a necessary precaution on a line where even a slight service interruption might have serious and cumulative consequences. 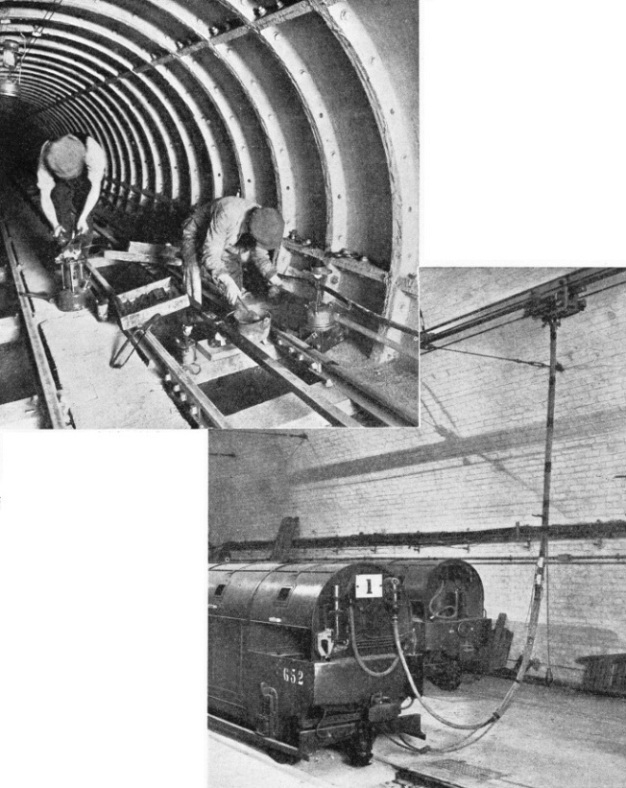 There is an elaborate system of intercommunication telephones, and, following standard passenger tube railway practice, the tunnels are equipped with bare telephone wires, to which a portable instrument can be clipped for use in case of breakdown or emergency. In addition to having the largest station, Mount Pleasant also houses the car sheds. These are situated at a slightly higher level than the running lines, to which access is by a 1 in 20 incline. Entry of the vehicles to the station at safe speeds is ensured by an electrically operated cam-shaft device. 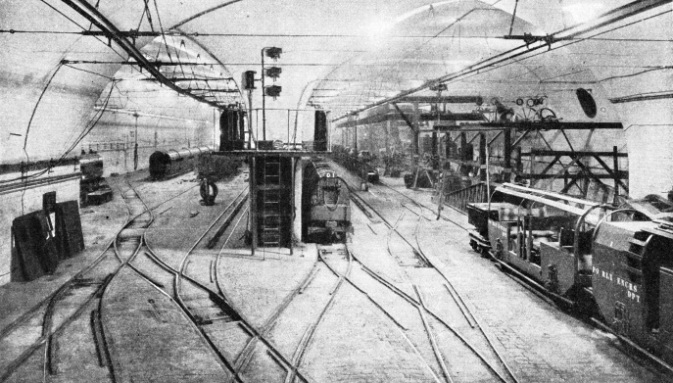 The depot is equipped for the overhaul and repair of the rolling-stock, and is provided with inspection pits and three turntables, which, although not normally brought into use, can serve as reversing loops when required. The live rail does not enter the shed, vehicle movements being controlled by an overhead trolley system to which flexible electric couplers are attached. Shunters can also walk alongside a train and control it by a press-button device. A circular vertical shaft is situated at one end of the depot, the purpose of which is to admit the entrance of new rolling-stock, this being a characteristic example of thoroughness in providing for a contingency that by its nature can arise only on rare occasions. One may incidentally recall that the City and South London was in its earlier days equipped with a car lift for bringing the vehicles to the surface so as to reach the sheds and repair depot at Stockwell, while when a car on the Glasgow Cable Subway requires overhaul, it has to be slung up to the workshops on a crane. A typical example of the conveyers used is at Liverpool Street, where traffic is interchanged with the London and North Eastern Railway terminus. Two parcel conveyers, 315 ft long, running at 180 ft a minute, and with a load capacity of a ton and a half, connect the No. 10 and No. 11 main line platforms with the tube. 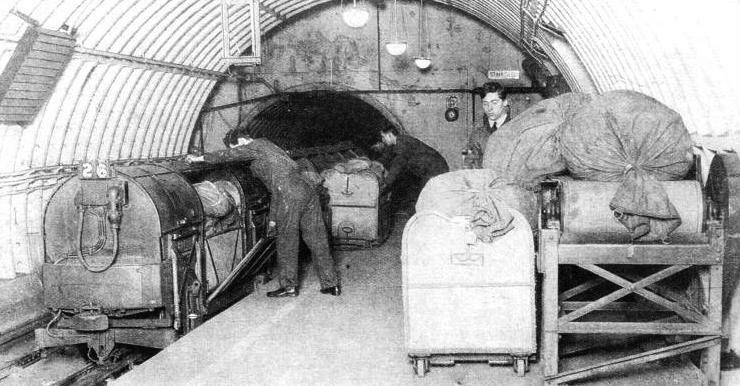 The mail bags are handled through platform hatches, as at Paddington, but double-spiral chutes serve here as intermediaries between platform and conveyer. The lay-out here necessitates that the conveyers should at one point change both in the horizontal and vertical direction, and they are therefore constructed in two parts, connected by chutes and gearing. Two other conveyers deal with letter bags, and are of the same general dimensions and constructional details as those used for parcels, save that their width is 28 in, as compared with 3 ft of the parcel-handling appliances. The speed of the conveyers at the different stations varies considerably, ranging down to a minimum of 30 ft a minute. Each is driven by its separate motor, and starting and stopping are by push-button control from the tube railway platforms, while a duplicate control system is situated at a convenient point at the head of the conveyers, this representing another characteristic example of duplication of equipment, all of which is incidentally of British manufacture. BATTERY-DRIVEN LOCOMOTIVES are held in readiness for emergency. These engines are 17 ft 1-in long, 3 ft 5-in wide, and 4 ft 11-in high, with a working weight of 7 tons. These locomotives can start a load of 18 tons on a 1 in 20 gradient, and haul 54 tons at 16 miles an hour. The Post Office Tube has been described as being “perhaps the best example of a robot railway in the world”, but the description requires qualification. It is a robot system in the sense that there are no signals and that its trains are driverless and automatically “keep station”, but, as we have seen, this method of working has largely been made possible by transferring the control of train movements from driver to signalman. (Switchman would really be the better word.) This official is, however, reinforced by automatic electrical devices. The line is track-circuited throughout, and between stations operation is entirely automatic, but only semi-automatic within the station limits; while trains are automatically brought to a standstill, they are started by the movement of a lever in the signal cabin, from which the points and crossings are also worked. The automatic sections are normally “live”, while the braking sections and those within the station are “dead”. Clearing a section temporarily cuts off the track current, which is again automatically restored with the further progress of the train. On arrival at the braking section, which is “dead” and is situated on a rising gradient of 1 in 20 to ensure further retardation, the train first comes to a stop, and is then automatically re-started by a cam-shaft device, provided that the signalman has operated the “receive” lever which clears the route for a vacant berth in the station. This section is “dead”, and the train therefore comes to a standstill. The length of the stop on the braking section is normally only three seconds, after which the cam-shaft closes a contactor and energizes the train at 440 volts. Five to ten seconds later (the time depending on the particular station) the pressure is automatically reduced to 150 volts. IN SERVICE. This is the type of wagon used on the GPO subway. The carriage frame in which the mail containers are stowed is carried on two maximum-traction bogies. Each bogie is equipped with a 22-hp electric motor which is automatically controlled. A possible contingency with this method of control is that in the event of a mechanical defect that reduces the speed of the train, the period of application of the 440-volt supply might not be long enough to prevent “stalling” before reaching the station berth, in view of the retardation caused by the 1 in 20 incline. To meet this contingency the braking section is divided into two track circuits, and should a vehicle stop on the first, the voltage is restored to 440 for a sufficient length of time to bring it to the station. A converse operation prevents the train from running into the station at too high a speed. Therefore we may say that no other railway approaches so near the robot. LOADING CONTAINERS FROM A CONVEYER. The mail bags are made up in the Sorting Offices and passed down the conveyers to the underground stations. Here, on the platform, the bags are placed into the containers read to be wheeled into the trains. You can read more on “Chicago’s Unique Underground”, “Railways Under London”, “Underground and Overhead Lines” and “The Underground Electric” on this website.